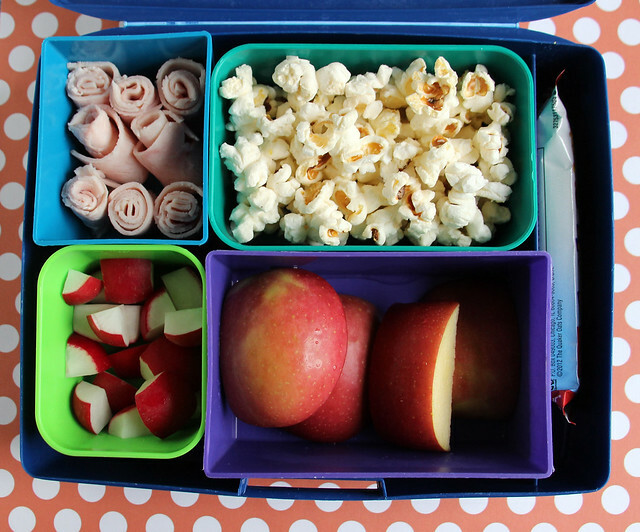 I mostly went with really simple lunches this week and Wyatt started off with this Laptop Lunches bento: deli turkey pinwheels, lemon-parmesan popcorn, apple chunks and radishes. I also slipped a granola bar into the silverware compartment. 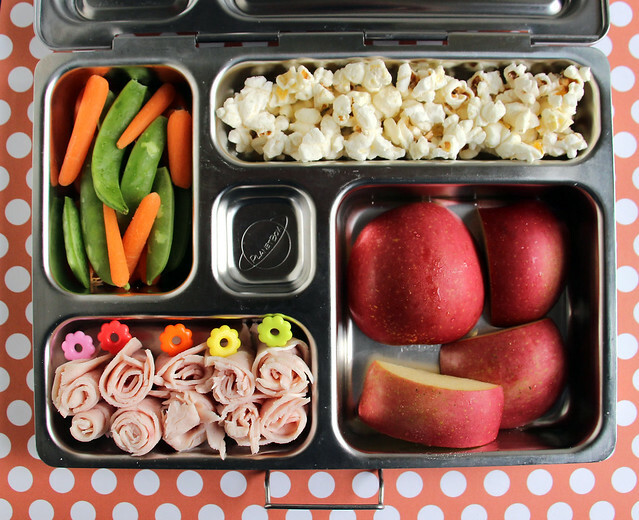 Augie’s lunch was similarly low-key: carrots and snap peas, the same popcorn, apples, and deli turkey roll-ups on flower picks. This was packed in the PlanetBox . Augie and I made my favorite banana bread recipe Monday after school so both boys had it in their lunches on Tuesday. 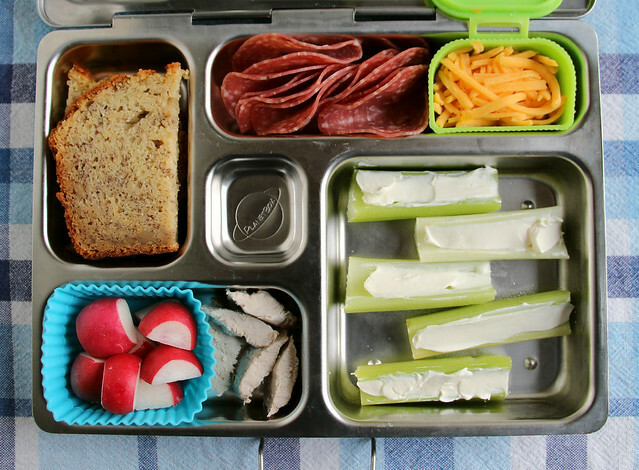 I packed a big slice for Wyatt in our PlanetBox , along with salami slices, grated cheddar in a small, lidded silicone cup, celery with cream cheese, leftover pork tenderloin from dinner and radishes in a square silicone baking cup . Wyatt has been boycotting most vegetables for a couple months now, so the celery with cream cheese was added in an effort to get him to try something new, but it was a dismal failure. It came home completely untouched. I used a Laptop Lunches box for Augie for only the first or second time, I think. Usually he chooses a different box, but he was super excited to use the new lunch bag I bought over the break so the Laptop Lunches box was a must. 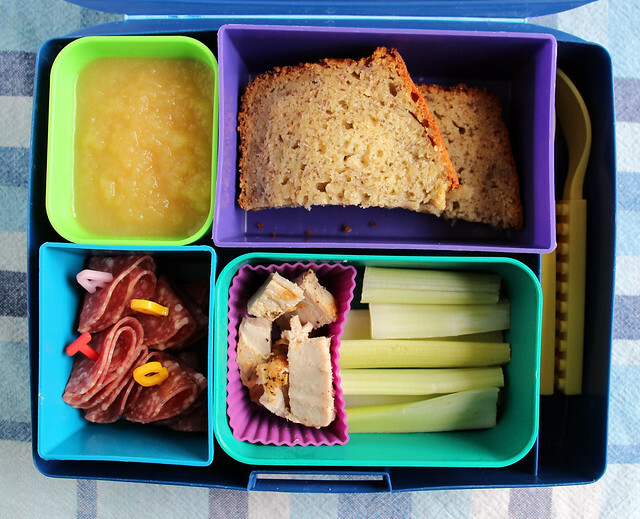 He had applesauce, banana bread, celery sticks, pork chunks, and salami speared with four alphabet picks that spelled out his initials (AQTC). I also remembered to pack a spoon for the applesauce for once in my life. On Wednesday Mama got her mojo back! I found some ninja-shaped cookie cutters on clearance at Target on Tuesday, so I had to make Augie a ninja lunch right off. Bonus: his letter of the week at preschool is “N” (which I didn’t remember when I packed the lunch, but sure worked out well)! 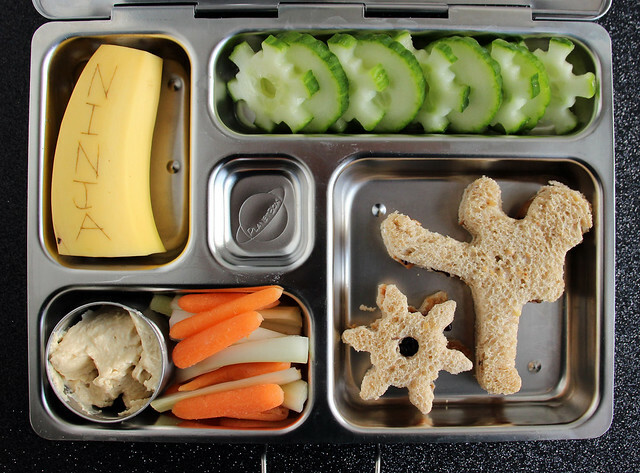 This lunch featured a ninja banana (I carved the word “ninja” into the skin with the tip of a paring knife and it turned brown on it’s own), cucumber throwing stars cut with a small snowflake cutter , ninja and “throwing star” PB&J sandwiches, and carrot and celery “nunchucks” with some hummus for dipping. This was packed in the PlanetBox . 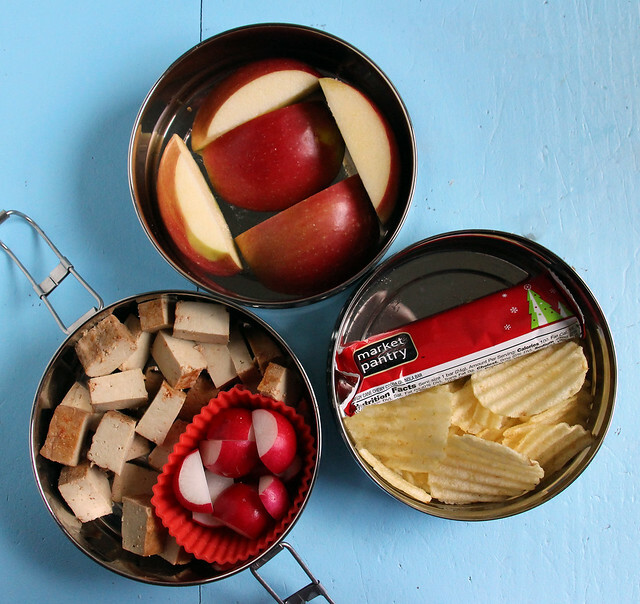 On Thursday I pulled out the ECOLunchboxes TriBento for Wyatt’s lunch and filled it with apples, baked tofu chunks, radishes, a granola bar and a few potato chips. 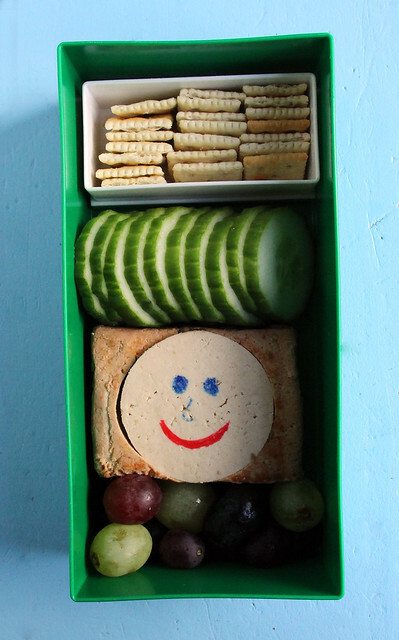 I packed Augie’s lunch in our Lego bento box : mini saltines (in a smaller Lego container ), cucumber slices, baked tofu with a smiley face drawn on (per Augie’s request) and a hand full of grapes. I also remembered to slip a small cup of hummus into the box after I took the photo. 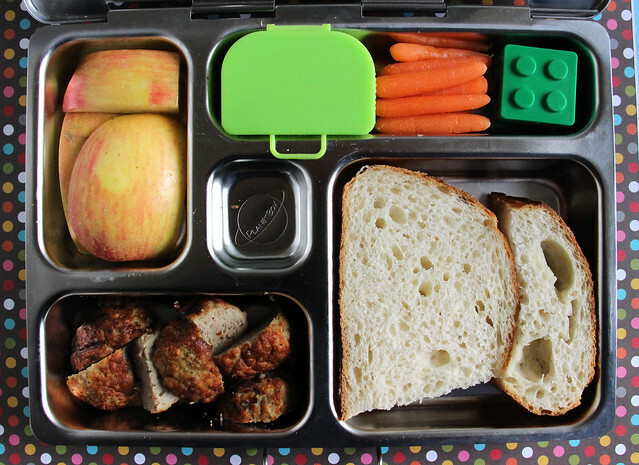 Today Wyatt had apple chunks, that little suitcase of grated cheddar, carrots, a small Lego container with a little butter, sourdough bread and turkey meatballs. He used the PlanetBox again. 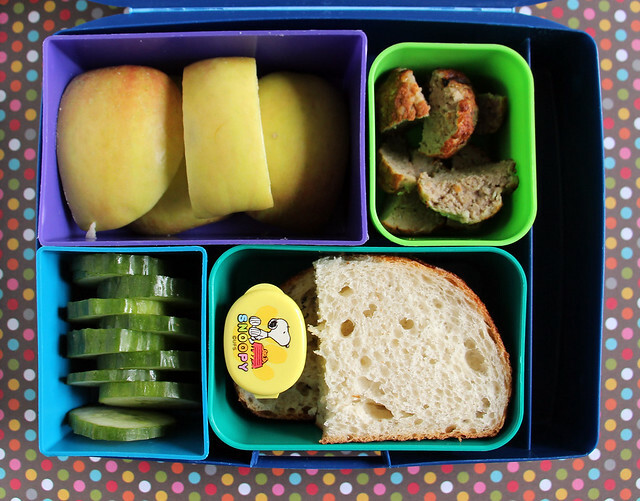 Augie also had apples, meatballs, and bread and I swapped in cukes and a Snoopy cup filled with hummus for Wyatt’s cheese and carrots. This was packed in a Laptop Lunches box.